An experienced house stager has a lot in common with a fully-loaded Swiss Army Knife™. Since WWII, the trusty Swiss Army Knife™ has been the go-to tool for soldiers, campers, fishermen, construction workers, even Hollywood Bowl goers (mainly for the corkscrew and for slicing cheese:o). 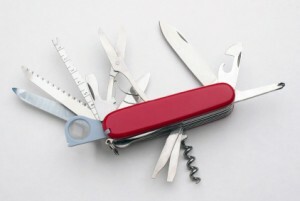 I even have a Swiss Army Knife™ in my home staging tool kit! The Swiss Champ™ has 35 tools or "features" and there's not a lot you can't fix or attend to with a Swiss Champ™in your pocket. The more experienced the home stager, the more tools she is likely to have at her disposal. As you can see, an experienced home stager has a lot in common with the trusty Swiss Army Knife™. Smart home owners, real estate agents and real estate investors have one in their pocket. Do you?